A week ago we had 15+ inches of snow. But two days of rain and milder temperatures later in the week effectively rid us of most of that snow (except for large mounds piled up in parking lots!). 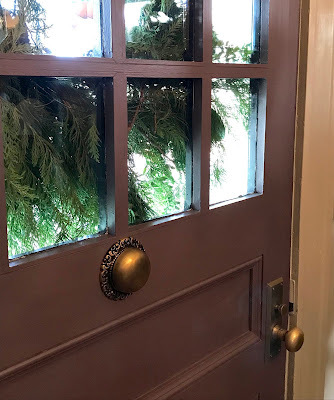 With warmer temperatures in the 50s and the sun shining this past Sunday, my husband and I enjoyed an historic homes tour that was postponed a week due to the previous weekend's weather. It was a great day to be outdoors! 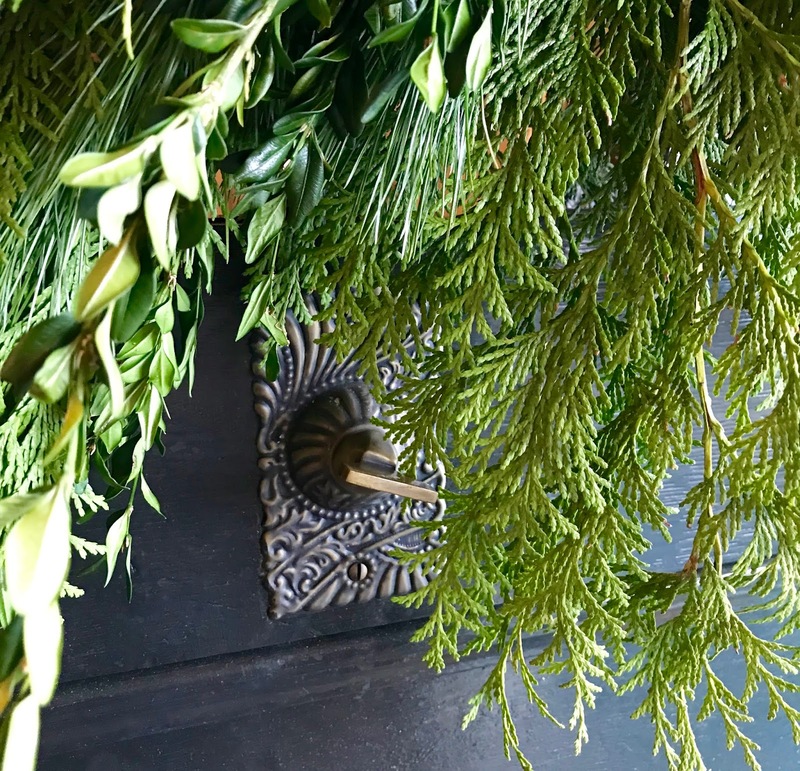 Six of the eight homes on the tour were built prior to 1920, and one home was built in 1874! There were a couple of houses that really stood out to us, so I wanted to share a few photos with you (this tour allows photography – I always ask before snapping photos). My favorite home on the tour was this one built in 1915. 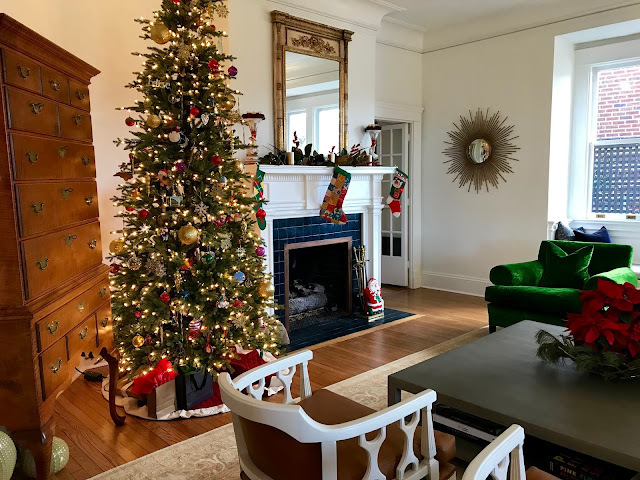 It features a combination of Colonial Revival and Craftsman style influences with a wrap-around porch, leaded glass windows, 11-foot ceilings and original hardwood floors. From the moment I walked in, I knew this was going to be a gem. 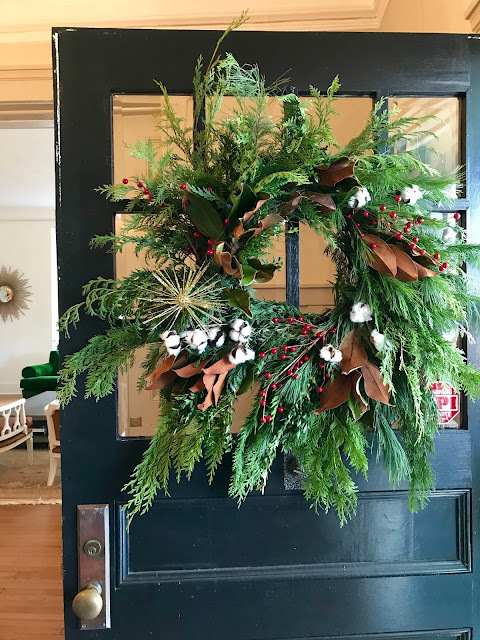 Here is the front door with its lovely wreath (notice the stems of cotton – very southern!). The next two photos show close-ups of the doorbell ringer on the outside and inside. It is this kind of detail I love in older homes. 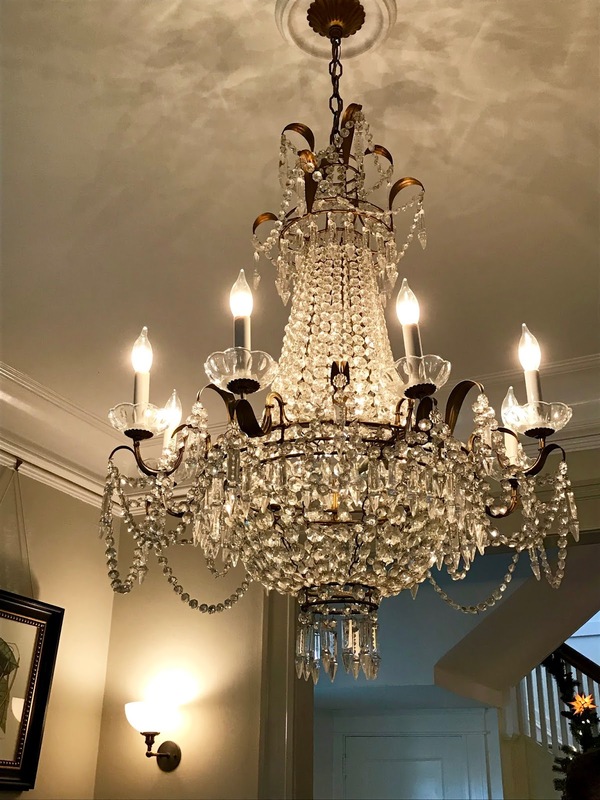 A 1940s chandelier in the foyer once hung in a county club. 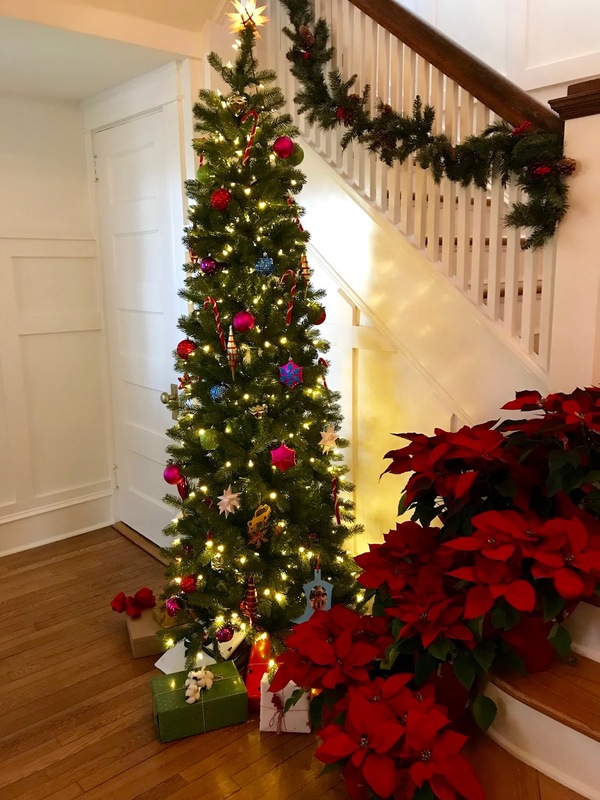 The expansive foyer features a slim Christmas tree, cascading red poinsettias and evergreen garland on the banister. A second Christmas tree graced the living room. I love the matching emerald green velvet chairs and the large, modern cocktail table. The den was my favorite room in the house. 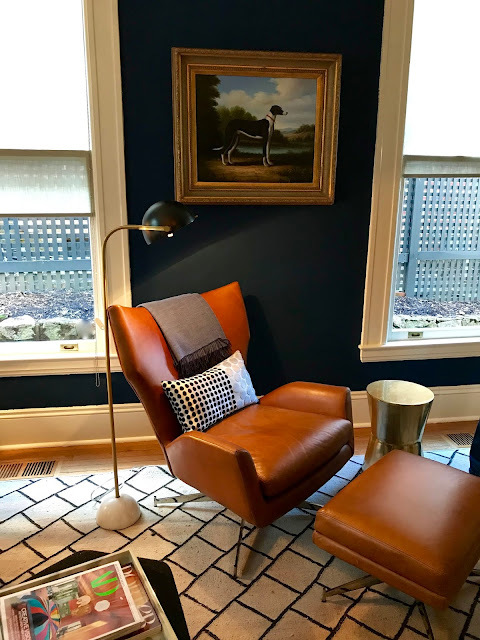 The deep blue walls gave the room a cozy feel, but the white sofa and modern leather chairs made the room feel fresh. 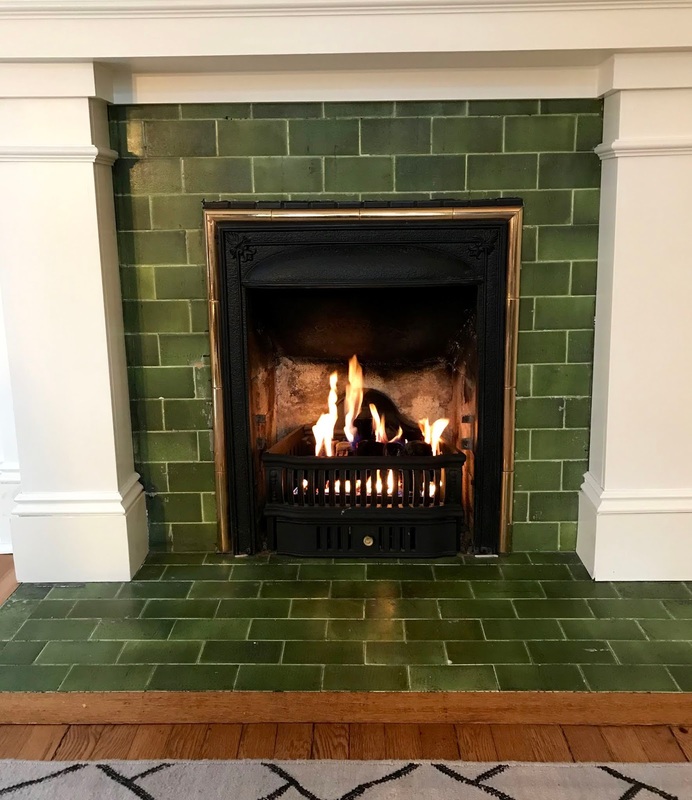 The original coal-burning fireplace has been converted to gas, and the green tile is very much like the tile around our home's fireplace. 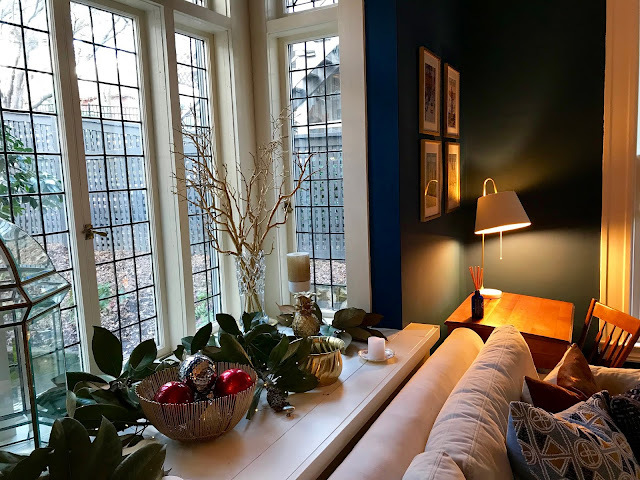 Above the fireplace (not shown) is a huge flat-screen television and on the wall adjacent to the sofa are built-in bookcases. 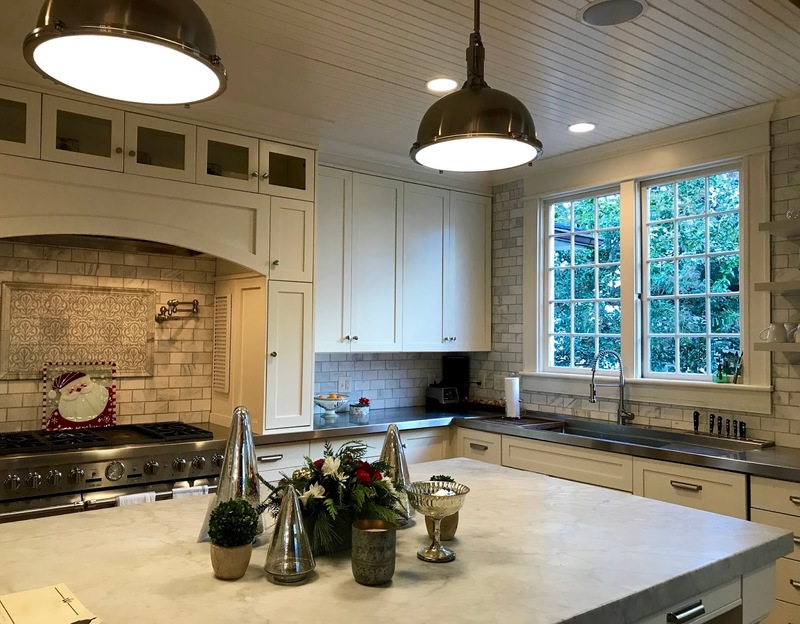 The kitchen was stunning, from the marble and stainless steel counters to the huge island and light fixtures. The deep sink is just what my husband and I would like one day in our kitchen. And look at the wall of built-in storage! 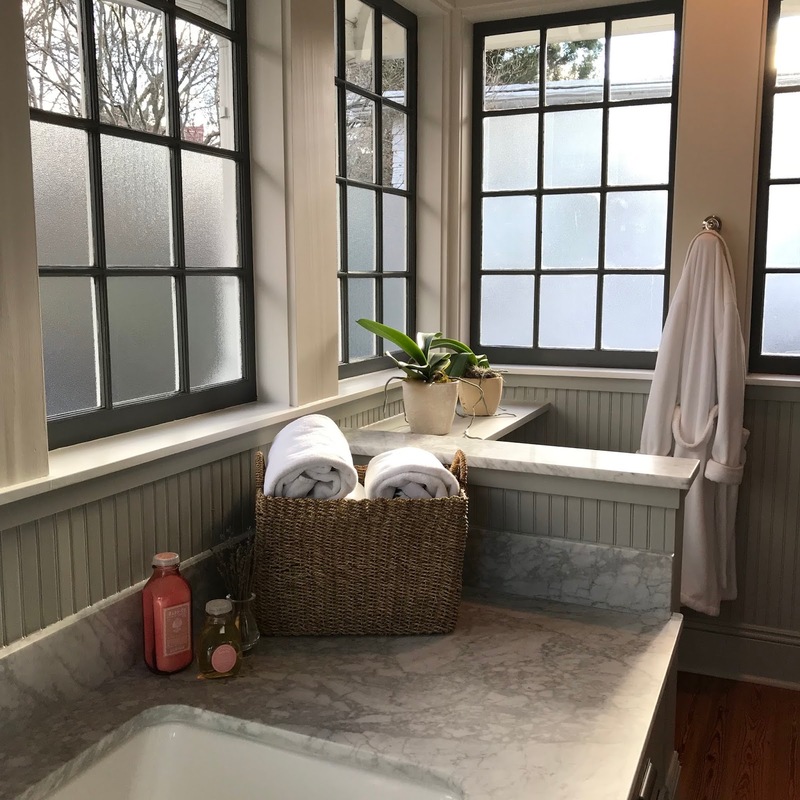 Equally as stunning is the master bathroom. 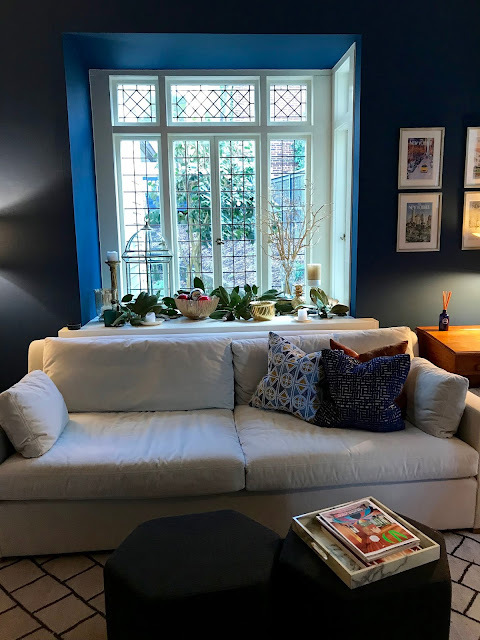 I felt like I had stepped into a magazine layout! It's very clever how they used patterned glass in the bottom window panes for privacy, while the upper panes are clear. My husband was particularly envious of the deep soaking tub. Thanks for sharing these photos, Claudia. So beautiful - modern, yet in keeping with the elegance of the original home. That is an extraordinarily beautiful house. I love all the attention to detail. 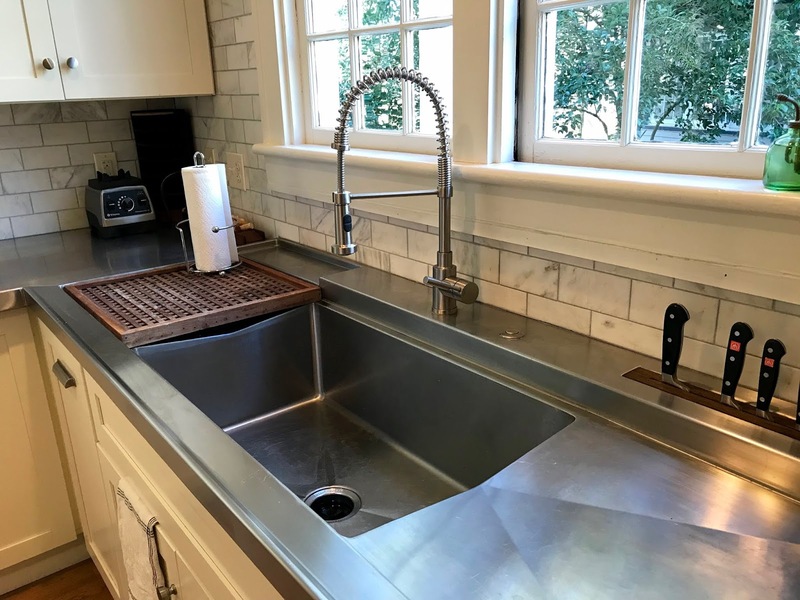 Those countertops are the cat's meow. Nice to see custom millwork done like that today. 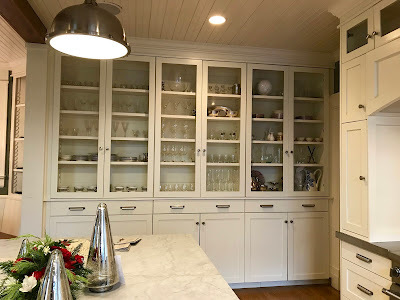 I know many people don't like louvered cabinet doors, but I adore them! I also like the lack of window treatments. Just beautiful!